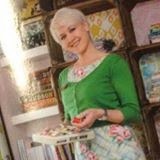 Homespun Stitchworks..... For the love of vintage: All the fun of the vintage fair! And what a wonderful morning it is, the weather is so beautiful. As you all know I went to the Vintage Bazaar on Saturday at Frome and it was amazing! It was their annual textile fair and I felt that the organisers had pushed the boat out and gathered some amazing people selling such wonderful fabrics. The organisers are Liz and Clare and they work extremely hard to make it look so easy and enjoyable! When we arrived at the Cheese and Grain in Frome, you knew you were at the right place as this darling was parked outside. We went inside and paid our £2 entry fee. Always, there are lots of leaflets with up and coming vintage fairs and you can gather those up. I was told by Jack that there was a stall with oodles of vintage paisley and to head for that straight away which I did..... I must report that I bought some amazing ones in such stunning colours and I am thrilled. This stall was Nostalgia at No 1 stall with paisley's! When you go to these events some people dress for the occasion and for some it is a life style. I met two such people. This lady is Marion and she always dresses in vintage clothes, I have seen her before and she was in the most stunning outfit in duck egg. I plucked up the courage on Saturday to ask if I may take a photo of her for you all to see! Then I moved along and met a wonderful lady called Emma who had a stall as well and she informed me she dresses in vintage clothes all the time. She is allergic to the likes of top shop and other high street shops, she told me. I think you will agree she looks amazing and so was her stall. The lovely Emma and her stall. Then I moved on and went to see the lovely Donna Flower and her beautiful stall. I was able to pick up some really beautiful pieces of vintage quilts for my needle work cases that I make. In addition to that I purchased some lovely fabrics and a rare hand painted design for fabric which was done in the 1930's.... this was the original art work for fabric to go to print. I am going to frame it for my stitching room. I now own a wonderful piece of fabric history! By now the place was packed out and the atmosphere was great. I had said that I would find a lady there who belonged to my blog and who had a stall. I am pleased to say I met a few of my blog members and it was lovely to put a face to some names. This stall was vintage Jane's stall that she shared with a friend and it was wonderful to meet her. We had a great chat and she had some great stock. Her vintage buttons were stitched to old playing cards... it was really a great way to display them. The next stall was Vintage to Victorian and this stock and stall is owned by a lovely lady by the name of Sue...... We had a lot of laughs and great chats about vintage fabrics and buttons and life in general. I bought a great piece of vintage paisley from her and some mother of pearl buttons. We have arranged that I will phone her to meet up again..... To meet people so knowledgeable about fabrics and who are so passionate about the same things is a great thing. In fact I was talking to Donna Flower about the same thing earlier.... We no longer felt like Dodo's... there are more of us!! The stalls were buzzing and people chatting and happy and I got to say hello to Liz and Clare who both had stalls as well as organising the event. People had come miles to be there and it was certainly worth it. The hard work that goes into it and the hours these people put in is phenomenal. The Cheese and Grain was full of wonderful vintage fabrics and goodies to purchase. The weather was so beautiful and we had lunch outside the Cheese and Grain and then I went back in and stayed to the end at 3pm. I had purchased some stunning fabrics, buttons, lace and other fabric goodies. Met up with some lovely friends, chatted and learnt more about how to tell the age of certain fabrics and lace. The people who have the stalls are very knowledgeable and helpful. Anyone who was buying vintage for the first time would have had help from the best. We had a great day and now I have to wait until Oct/Nov before the next vintage bazaar.... although there are lots of other venues for the summer and the stall holders will be attending some of those. I hope you have enjoyed a quick walk through the vintage bazaar and have a Happy Stitching Day! What a lovely write-up and so pleased to have finally met you!